The NVIDIA GeForce GTX 1080 Ti is a mean machine based on NVIDIA's second-biggest implementation of its "Pascal" architecture, the 16 nm "GP102" silicon. This is the same chip that drives the TITAN X Pascal. 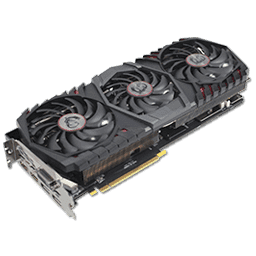 The GTX 1080 Ti features the same number of CUDA cores as the latest TITAN, at 3,584 spread across 28 streaming multiprocessors. There is some cost-cutting here, but none that is designed to lower performance - the chip has a slightly narrower memory bus at 352 bit; that's a memory chip less than what you'd find on the TITAN X Pascal. The total memory amount is hence 11 GB. A cluster of ROPs is also disabled, so you now get 88 ROPs (as opposed to the 96 ROPs on the TITAN). The memory chips are, however, clocked 10% higher to make up for the 8.3% narrower memory bus. This move also translates into cost savings due to the lack of a 12th memory chip and probably better yields for the GP102 chip. 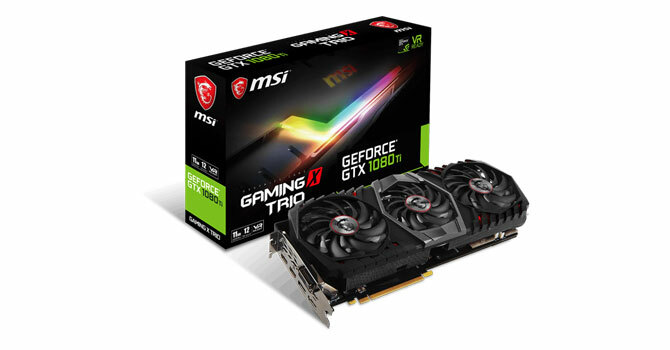 The MSI GTX 1080 Ti Gaming X Trio came to us as a surprise and is probably one of the last custom variants of the GTX 1080 Ti that will be released. MSI has taken the fantastic thermal solution of the GTX 1080 Ti Lightning and put it on a GTX 1080 Ti Gaming X PCB, which should help with cost. Also removed are overclocker-specific features like dual BIOS and voltage measurement points. Overall, this results in a card that makes huge promises: best noise and temperatures with a pretty RGB backplate without breaking the bank. We will investigate this closely in the following review. According to MSI, the price for the Gaming X Trio is €829, which seems slightly off as the card is now listed for €899 in shops (both prices include VAT). Its exact price in US dollars isn't available yet; for the comparisons in this review, we used $850, which should roughly match the expected price point.